I told you a few weeks ago that we knew what must be done. It has taken this long to steel myself to do it. CJ the Cat (from CJ Harris Hospital where I worked) showed up as a very small lost kitten at the Emergency Room door in January, 1990. I put her in a box and carried her home to our daughter, who excitedly said that CJ (a.k.a Calvin, both perhaps from our Presbyterian connections but more probably from our son’s hero, who also had a cat sidekick) would go with her to college the next year. Daughter went, cat never did. CJ was an indoor cat once upon a time, but her shreading effect on the furniture sent her permanently alfresco–except for when she and I lived on Walnut Knob that first year in Floyd County without the SheBoss, during which time cat went anywhere inside or out that her highness desired. She’s never been an especially affectionate cat, but we bonded that year of living with only each other’s company most of the time. We came to an understanding. Since moving to Goose Creek, she’s been a porch cat, and until recently, managing quite well for herself. Until she started going blind a few months back, a process completed several weeks ago. It’s a terrible thing to watch a cat fall off the edge of the porch or walk into her water bowl. Winter is soon upon us, and already CJ howled in the wee hours, unable to find her box in the cold. As of a half hour ago, she now is in her final rest, up beside Nameless Creek, under a headstone formed by one of the big rocks plowed out of the pasture ground a century ago. She felt no pain. I, on the other hand, will need some time to recover from the sting of sending her out of this world after almost 17 good years. There were just barely enough Powermilk Biscuits to get up and do what needed to be done. Thanks, Andy, for providing a caption for this image. All I expected was to put up the picture, but was pleased to find your perceptive words in a Flickr comment for this one this morning. Oh, and from a purely photographic point of view, that reflection in the creek is magical. Swing over and take a look at Andy’s photos of his travels in and about the peaks and glades of Western Europe and the UK. I can’t even imagine, but we should all try to, and sometimes I do. I am standing on the front porch in the early morning with my coffee. The sun is just painting enough light behind the ridgetops to make rise and fall of their silhouette into the rim of this chalice-valley that holds our lives. With a sudden, sickening slap against my feet in the near-light, the yard, the house, the entire watershed of Goose Creek shocks as smoke and dust rise from what had been forest along the skyline. And when the cloud of pulverized earth settles, the trees are gone. The familiar contours like the lines of loved one’s face, have disappeared forever. Then, a massive machine rises above the ragged horizon. It pushes what is left of our mountaintop through what is left of our forest in to what used to be Nameless Creek, into my Fortress of Solitude where the three poplars converge, where I wanted my ashes placed; where our sitting bench has been, next to the little island covered in asters where the white waters will be no more. 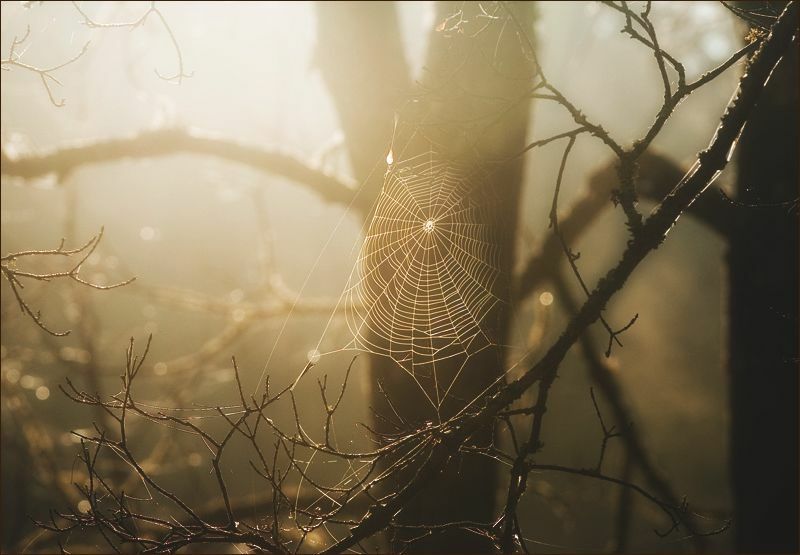 This image of an early morning spider web was taken at just this place of my nightmare. A bad dream. Mountaintop Removal is a bad dream that is a new reality every day for someone, for some family, for some community somewhere in West Virginia, Kentucky, Tennessee or Virginia. And unless we force ourselves to look at it in all its ugliness, unless we come to see our own complicity by our very silence and by our consumption without regard for the costs, there will be no end to it. Some of you who are from or have a heart for the southern Appalachian mountains are surely aware of the costs of “cheap coal”. Most of you who read this here are genuinely uninformed, and there’s a reason for that. Until recently, the people most affected have not had sufficient voice to lift this issue above and against the powerful forces that want it invisible in the national media; that want vast stretches of remote, sparcely-settled, pristine watershed, forested plant and animal habitat and the physical context of mountain people’s lives to be seen as nothing but “overburden”. There has been an political policy of silence at the highest levels. This must stop. We must be a part of the end of mountaintop removal for coal extraction. Please take a few minutes and watch this short video from ilovemountains.com that just begins to tell the story. Do you love mountains? Then take 8 minutes to learn what’s at stake. Yesterday, I took a pleasant solo drive from Goose Creek over to the Blue Ridge Parkway. Now that the leaf-peepers have no leaves to peep, I had the long, high road to myself for 35 miles, all the way to Fancy Gap. 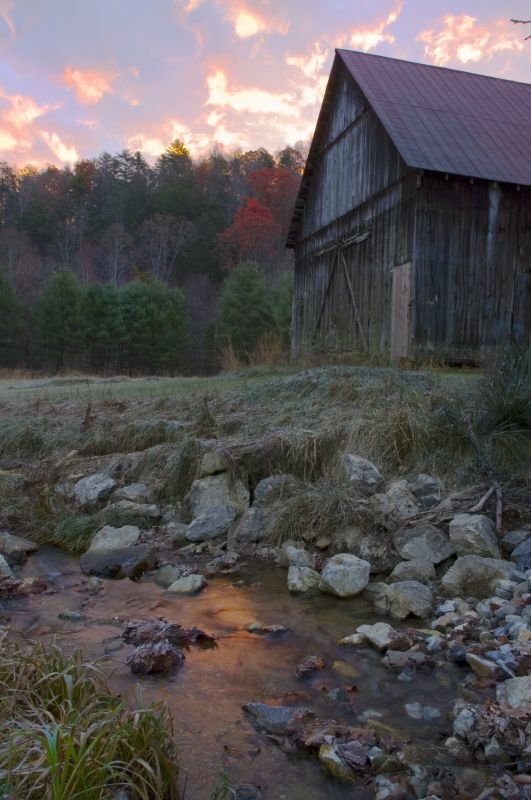 And for the first time in thirty years, I wound down the mountain the old way–on Route 52–to the bottom of the Appalachian Escarpment, to the foot of the Blue Ridge Mountains and the piedmont of North Carolina. My destination: Mt. Airy, a town that reared and now prospers on Andy Griffith. It’s almost too much as you walk along Main Street. Opie this, Aunt Bee that, and of course, Floyd’s Barber Shop. Small wonder the whistled theme music wasn’t piped out onto the streets at every corner. But altogether, a nice unwalmarted downtown still flourishes. Promptly at noon, Traveler Trish arrived at the Snappy Lunch–a local diner of some reputation, but as small as Aunt Bee’s kitchen and we’d have to wait for one of the three booths. So we ended up down the street instead at the Blue Plate Diner (if I’m remembering right) and they were very accommodating. Later, we walked the sidewalks through the older homes near town and chatted, catching up on a year’s worth of accumulated water under our bridges. She’s been around the world. I’ve been around Goose Creek. But we’ll do that again, Mt. Airy being about half way between us. Trish was one of the first to find Fragments, sense a resonance of fellow-feeling with a would-be writer and offer to get together to chat about writing, about goal setting, discipline and about getting your book’s essence down onto the back of a business card–one of the hardest assignments I’ve ever been given! A writer by background and temperament, Trish left that behind to form and promote WorldsTouch, and just returned from many months putting feet on her intentions to make some small, remote corner of the world a better place. And she’s not done yet, only home to save up enough to go back to India, Nepal, who knows where she’ll travel and do this good work next. It was a great pleasure to hand her a book across the table in the diner in Mt. Airy yesterday. I never would have imagined four years ago when we met that we’d have to be careful not to get frenchfries grease on the cover of my book in the middle of Mayberry. Pictured: The distinctive silhouette of Pilot Mountain (aka Mt. Pilot–the bigger town not far from Mayberry) as seen from the Blue Ridge Parkway. And let me add: Slow Road Home is now available at PAGES BOOKSTORE on Main Street in downtown Mt. Airy. Now there’s both a destination AND a purpose for a Saturday afternoon drive. You’re welcome. I look at the exotic images from far away places taken on great adventures by photographers who post their works now so easily on the web for all to see. There are breathtaking panoramas in mind-numbingly beautiful light; local people in bright dress engaged in unguessable celebration or worship; and amazing animals in lush rainforest or stark desert places I cannot imagine. Then I look at my monthly photo-archives of very ordinary local insects, pasture flowers, fall leaves, and always: the barn. It is certainly the most photographed structure in all of Floyd County, and almost all of those images are mine. But that’s okay, and by intention. Almost five years ago I heard the story of a New York City photographer who became disabled to the extent that he was not able to leave his room. His room, fortunately, was on the fourth floor of an apartment building that bordered Central Park. But his passion for capturing the everyday scenes of his life didn’t end. He continued his career for several years, growing where he was planted, taking thousands of images from his window–of people passing by on the sidewalks below, of snowfalls on treetops in the park, of light reflected from the windows of the building across the way, even of pigeons on his windowsill. That story of immersion in the close-at-hand resonated with me that winter. And six months later an empty page of time opened in my life when I left my profession not knowing what would come next; and I remembered this story. Even if I don’t leave the house every day and see no other people but the mailman on his rounds, I told myself, there is a world of color and form here in this valley–easily enough to keep my camera and eye, mind and heart filled with good images to contemplate and to share. And prominent among those images, the barn. It is an illusory symbol of permanence here. The house is much changed since we first saw it in 1999, with a new front porch, new windows, foundation, a paint job, and now the Annex. The house has been “improved” and it shows to anyone who knew the house in its earlier incarnation. But the barn would have looked just the way it does now at the time my grandmother was born. And this old structure hewn from logs cut on these hillsides puts the human lives lived here into the beauty of the natural landscape in a way that I find comforting, and visually satisfying–to draw the eye to its unnatural straight lines in contrast to the pleasant curve and chaos of nature.